In a series of short works such as De Libertate Arbitrii (On Free Will) , De Casu Diaboli (The Fall of the Devil) , and the lengthier dialogue Cur Deus Homo (Why God became Man ), Anselm propounded a satisfaction theory of the atonement, upon which the incarnation promises relief from the strict demands of divine justice. He defended a notion of the relation between philosophy and theology that, like Augustine's, emphasized the methodological priority of faith over reason, since truth is to be achieved only through "fides quaerens intellectum" ("faith seeking understanding"). Anselm's combination of Christianity, neoplatonic metaphysics, and Aristotelean logic in the form of dialectical question-and-answer was an important influence in the development scholasticism during the next several centuries. 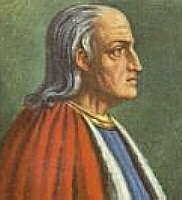 Most famously, in the Proslogion (Addition) , Anselm proposed the famous Ontological Argument, according to which god is understood as "aliquid quod maius non cogitari potest" ("that than which nothing greater can be conceived"). The being so conceived must necessarily exist in reality as well as in thought, he argued, since otherwise it would in fact be possible to conceive something greaternamely, something exactly simliar except that it really does exist. Thus, at least for Anselmian believers guided by a prior faith, god must truly exist as the simple, unified source of all perfections, a reality that excludes corruption, imperfection, and deception of every sort. R. J. Kilcullen's lectures on the Monologion and the Proslogion. Thomas Williams's article in The Stanford Encyclopedia of Philosophy. A paper on Anselm's Proof from Gyula Klima. W.H. Kent's article in The Catholic Encyclopedia. .